The history of St. John, USVI, now home to CimmaronStJohn, goes all the way back to its fiery volcanic birth over 100 million years ago. The beginning stages of island formation started underwater, when the first volcanic flows were uplifted and exposed. Four other stages followed, until limestone and sediment eventually surfaced over an extended period of time. The first human inhabitants of the island didn’t appear until much later, however. The Arawak Indians are thought to have reached the Virgin Islands around 300 AD, establishing a fishing and farming community until driven out by a cannibalistic tribe known as the Carib Indians about 100 years before Christopher Columbus arrived. The history of St. John was documented more clearly from that point, and a variety of photographs of the history of St. John are available via the St. John Historical Society! 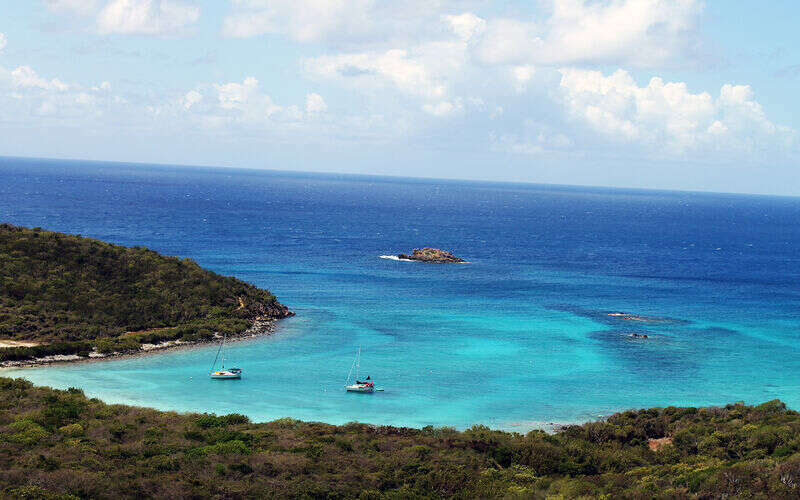 Here are just 5 facts about the history of St. John that you should know before your stay at a CimmaronStJohn villa or vacation home. In 1493, Christopher Columbus landed in the Virgin Islands on his second voyage to the Caribbean. Though the Arawak Indians were the first inhabitants, Columbus dubbed the islands Spanish territory. Thus began a period of slavery of the Carib and Arawak Indians by the Spanish colonists. Sadly, most of the natives died of malnutrition and disease, with over one million casualties or escaped refugees in less than 20 years. The history of St. John unfortunately wouldn’t be complete without the slavery that occurred on the island’s sugar cane plantations. These plantations were a main source of income for St. John, and windmills and horses were used to process sugar cane, guided by slaves who first cut the sugar cane. Sugar mill remains are scattered around the island, from a sugar factory in Cinnamon Bay to windmill ruins on Peace Hill. In Coral Bay, you can view the remnants of a Danish fort, which was constructed in the early 1700s. The remains serve as a memorial of the slave rebellion on St. John that occurred in November of 1733. The rebellion lasted for six months and was one of the most successful in Caribbean history. All but one of the Danish soldiers at the fort was killed, and a cannon was fired to instigate more rebellious acts across St. John. The 300-year-old wall of the fort barracks still remains to this day and an old cannon points toward Coral Bay as a commemoration of this bold act in the history of St. John. The Virgin Islands were a haven for buccaneers, who would watch for approaching ships through spyglasses before making an attack from one of many bays around the islands. The most favorite visitor to the islands, according to lore, was Blackbeard, who staked out on St. Thomas. Now, you can visit Blackbeard’s Castle, which is a National Historic Landmark on St. Thomas, which includes walking tours and history lessons about pirates in the Virgin Islands. The castle was constructed in 1679 and served as a lookout from the shore (though if Blackbeard ever used it, we’re not sure). After slavery was abolished in 1848, the Virgin Islands (then known as the Danish West Indies) began a new chapter. The sugar industry declined, and in 1917, the United States bought the islands for $25 million as part of military defense, preventing the islands from becoming a German submarine base during World War II. After this point, St. John became the tourist destination that it is today, with crystal clear waters, perfect weather, and a sandy beach waiting for you! The history of St. John is one to not be forgotten. From slavery on sugar plantations to piracy, the Virgin Islands were not always the paradise that they are today. It is important to remember the past so we can appreciate the present and look forward to the future! Book your stay today at CimmaronStJohn to become the future history of St. John! Photo Credit: St. John Historical Society, source/Jack Boucher, photographer/Library of Congress, HABS, owner/HAER Collection General view of east and south sides of overseer’s house from southwest, stable area at right.